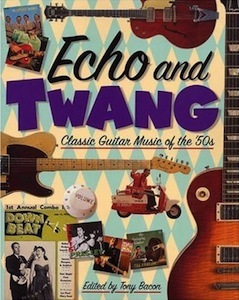 Echo And Twang, which appeared in 2001, was a re-titled and new-jacketed edition of Classic Guitars Of The 50s (original jacket below) which we’d put out five years earlier. Otherwise it was exactly the same. We did the same thing with Fuzz And Feedback which was dragged distorting and screaming from Classic Guitars Of The 60s (more about that one here). The idea was to combine a magazine-like editorial approach with the high-quality illustrative look we’d already established. I rounded up good writers on the guitar and briefed them each on a 50s-related chapter to write for the book. I snagged a good team: Dave Burrluck on guitar construction; André Duchossoir on Gibson; Charles Alexander on jazz; Walter Carter on Fender; Tommy Goldsmith on country; Tom Wheeler on American guitars; Rikky Rooksby on rock’n’roll; Hiroyuki Noguchi on Japanese guitars; Michael Wright on mail-order guitars and on radio and television; Paul Trynka on blues; Stan Jay and Larry Wexer on collectability; John Morrish on recording; and Paul Day on European guitars. I wrote an introduction to it all, which you can read by clicking on the link here. 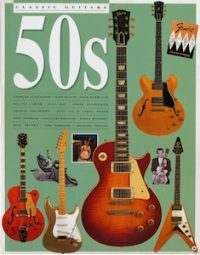 Everyone did a great job, and it seemed to me that the result was just as I’d intended: a multi-angled view of the guitar in the 50s, its importance in various styles of music, and all the great and not-so-great players and instruments that helped to create that music. I’m still particularly proud of this one and its companion, Fuzz And Feedback, because there’s never really been anything like them. I think they were a good combination of my magazine experience and Nigel Osborne’s design experience (although it was Sally Stockwell who actually put the look together).